Earlier: After a short telephone call with Gerfried I can tell you, that all climbers reached Camp 3 (7380m). The weather isn't very stable, it's very cloudy, the sight is quite bad. Tomorrow at 01.00 they will start the summit push. Earlier: Gerfried reports Wednesday from the base camp of K2: all goes well. In the base camp, the team also meets on old friends: Skyrunner Christian Stangl and the Spaniard Jorge Egocheaga. Jorge und Christian Jorge and Christian together with Louis Rosseau, Sepp Bachmair and Gerfried the ascent on Friday begin. Editorial note: No mention of the claimed summit by Jorge.... this past weekend, maybe a bad report?? The other four members of the team - Joelle Brupbacher, Martin Ramos, Quintero Santiago, and the carrier Qurben already have in the past few days and weeks great preparatory work and the Abbruzzi route up to Camp 3 well established. The group is currently in camp 2 and camp breaks Friday to 3 on. owever, there is good for the team news from Innsbruck: Charly Gabl gives green light for an ascent to the summit on Sunday - the team expects good conditions with little wind and good visibility. Earlier: Today, Saturday, Louis, Sepp and I will set off for K2 from Skardu. If everything runs to plan, we will be in Basecamp K2 on Tuesday 21st July. The past events are still very present. To lose Wolfgang was a big blow for us, and each of us must find our own way to deal with it. Also, the completely unfounded accusations from Mr. Garcia haven�t exactly helped the situation. Maybe on our short trekking trip, we will manage to bring things back on an even keel. Most of the OeAV participants are back at home. G�nther Unterberger, Hans Goger, Michaela Landl, Herbert Sch�tter and Kilian Volken are on a trekking tour from the M�rchenwiese to Gilgit and come back on the 22nd July. 6 participants who want to come with us on K2, are already in K2 Basecamp (Jorge, Martin, Santiago, Joelle, Dave and George) to acclimatise. We will send news again from Basecamp on K2. Earlier: Bad news from Nanga Parbat: Wolfgang Kolblinger is missing. All other members are save in Camp 4 and in basecamp. Details are at this moment not possible. Our thoughts are with Wolfgangs family. The summit success on Nanga Parbat (8125m) from a tragic event overshadowed: The search for Wolfgang remained unsuccessful so far. Detailed circumstances about the when, where and Wolfgang's whereabouts are not currently known. deepest sympathy in these difficult times to Wolfgang's family, especially his wife and his daughter. Earlier: After a very short telephone call, I can share the following good news: The first summit ascent of Nanga Parbat (8125m) is underway via the Kinshofer Route. The as yet unconfirmed report came about an hour ago, and according to Gerfried, involves Wolfgang K�lbinger and three other members. 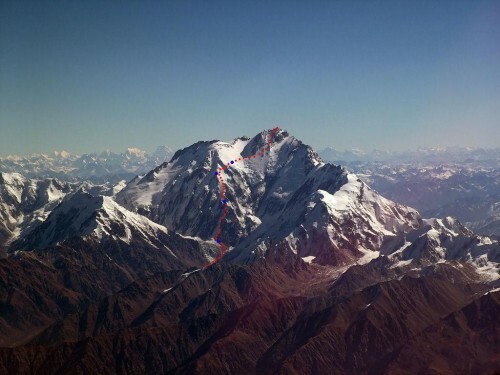 If and how many participants have reached the summit is guesswork at this time. The �New Route Team� has also safely arrived on Camp 4, where the New Route and the Kinshofer Route come together. Tomorrow, the team wants to storm the summit with G�nther, Hans, Louis, Sepp and Gerfried. Earlier: Despite the changeable weather, we have used the small chances over the last couple of days to acclimatise ourselves better. On Wednesday, we climbed direct from BC to C2 (6000m). Even a short, heavy blizzard in the Loew-ice crevice couldn�t stop us from ascending further. The track work, for which G�nther especially deserves a mention, was accordingly tiring. After a hard night, we wanted to ascend to 6500m yesterday. This time, a hail shower drove us back to the protection of the tents in C2 once and for all. This morning, we all descended by bad weather and snow safely back to Basecamp. Now we will recuperate for a few days to recharge our batteries. The following people were present on this all important acclimatisation excursion: G�nther. Hans, Louis, Gerfried, Herbert, Michaela, brothers Wenzl, Peter, Wolfgang, Sepp, Ronald, Kilian, Sandy, Rick. In all probability, there is a chance of a run of good weather from Monday. Maybe we could use this for a summit ascent. today, we had to unfortunately deviate from our original plan to ascend to Camp 2 (6000m) and stay there overnight, because the weather situation changed for the worse. Snow and storms are forecast for tomorrow, Tuesday � there is no chance of spending the night on the mountain. There is no bad news however, without good news! We changed our goal for today and �only� went on an acclimatization tour. G�nther, Hans, Louis and I (accompanied by Herbert, Michi and Sepp) left Basecamp and visited the Diama Glacier, and ascended to 5100m to observe our new planned route. We hit the jackpot with this tour. The start of our planned route should, depending on the conditions, be easier to reach than expected. It should improve from Thursday. We are concentrated fully on our acclimatization on the Kinshofer Route. By better weather, we will ascend first to 6000m, and then to 6500m and camp overnight. When we have done this, we should be prepared for a summit ascent. We will then try to put our project into action! Unfortunately, our team has reduced by one vital member. Our Doc (Dr. G�nther Straub) had to leave us for family reasons and will return to Austria this week. The whole team would like to take this opportunity to thank him for all of his excellent work and wish him all the best. Yesterday G�nther, Hans, Lois and I climbed thoug the Loeweisrinne and the techncally difficult 80m Kinshoferwall, and reached C2. We laboriously cut out a tent area and left 2 tents there. As a result, most participants reached C2 (6000m) yesterday (G�nther, Hans, Lois, Adriano, Giuseppe, Helmut, Sandy,Rick,Gerfried) and today (Herbert,Kilian, Peter, Wolfgang, Sepp, Gebr�der Wenzl) and all have descended safely into BC. This is a super achievement when you think that we first arrieved in Basecamp just over a week ago. We will now rest for at least 2 days in order to recover our strength. We have certainly earned this break after the last few tiring days. Depending on the weather, we will ascend to C2 in a few days and sleep there. The snow is slowly dissappearing from BC and we are moving to new dry camping areas. Earlier: The team has arrived and Already today the whole team will active start to acclimatize their bodies. They will walk to camp 1 (4900m) if the weather conditions will be stabled. Dear EverestNews.com, we�ll start from Vienna, Z�rich, Venice, Munich and Toronto and all meet in Islamabad on 12. June. We have been very busy the last weeks. Unfortunately our very good friend Peter Fessler has died 4 weeks ago while sleeping. Our expedition is again an expedition of the Austrian Alpine Club OeAV. We send update after our briefing.